Senior Makayla Willets recently finished an outstanding high school career which included 28-career shutouts. Mastic Beach, NY - October 29, 2018 - William Floyd High School senior Makayla Willets, a three-year starting goalkeeper for the William Floyd Colonials girls’ soccer team, recently finished an outstanding high school career which included 28-career shutouts, including seven this year which helped her earn Suffolk County Girls Soccer Coaches Association (SCGSCA) League AA “Goalkeeper of the Year” honors along with All-County accolades. The Colonials, despite an overall record of 9-6-1 (8-5-1 in League play) and outscoring their opponents 46-13, just missed the playoffs. However, that doesn’t take away all that they were able to accomplish on the field under first-year head coach Kaleigh Sidaras, who was named the SCGSCA “Large School Coach of the Year,” and a stout defense led by Willets’ goalkeeping. Willets’ journey both as a student and athlete does not end after William Floyd. She plans on attending Lees-McRae College in North Carolina, where she will be majoring in nursing and playing Division II soccer. She also plans to apply to Stony Brook University after she completes her undergraduate degree to pursue a master’s degree and hopes to become a physician’s assistant in Stony Brook’s pediatric oncology unit. All-State honors are still a possibility for Willets as they will not be announced until November. 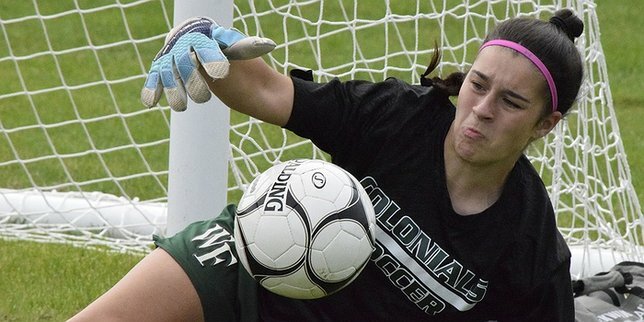 Subject: LongIsland.com - Your Name sent you Article details of "William Floyd High School Girls’ Soccer Player Earns ‘Goalkeeper of the Year’ Honors"